Environmental and land management in South America is being slowly but persistently militarized, with the aim of controlling extractive industries, especially gold mining. In Colombia, Brazil and Venezuela, as well as other countries, both conservative and progressive governments participate in this militarization. The basic dispute is not so much in avoiding negative environmental and social impacts, as in controlling economic surpluses. Colombian president Iván Duque recently presented the National Development Plan that will guide his four-year administration. The novelty is that it includes environmental management under national security and defense policies (1). Protection of biodiversity and water now appear alongside objectives such as defending borders and territorial sovereignty. The measure creates a new security force for “Comprehensive Environmental Protection”, made up of military and police officers who coordinate with prosecutors and environmental authorities. The Ministry of the Environment joins the National Security Council, environmental issues will be incorporated into the National Security Strategy and possibly even into the National Intelligence Strategy. From this “security” perspective, nature is presented as an “asset”. This is not a neutral concept– it comes from the business world and promotes the fragmentation of nature that prioritizes the economic value of resources. The plan proposes large-scale land-use planning instruments, called “Strategic Comprehensive Intervention Zones”, with medium-term (5 year) objectives in both security and environment, which would serve to transit towards “legal” exploitation of natural resources. The Colombian government does not hide its basic objective, which is to bring the illegal exploitation of natural resources, such as timber and minerals–especially gold, under control. Government officials admit that the nation confronts a dramatic situation: 86% of the gold extracted comes from illegal practices and 44% of the country’s municipalities engage in some illegal mining, either in gold or coal or other products. In Colombia, illegal mining is so widespread that it has marginalized legal, formal mining practices. Several other South American countries face the same dilemma, especially Bolivia and Peru where alluvial gold mining is expanding rapidly at the foot of the mountains and in tropical forests. The activity takes a heavy toll on the environment, particularly from deforestation and mercury contamination. It also causes hugely negative social effects, from the trafficking of girls and adolescents to the illegal trade of inputs and minerals. (2). The Colombian development plan does not aim to end these mining practices, but rather to control them and transform them into formal business ventures. Its goal is for the State to decide which companies participate and under what conditions they can exploit gold and other mineral resources, while obtaining a portion of the profits that this produces. Another extreme example is found in Venezuela, where Nicolás Maduro turned to liberalizing mining exploitation in the so-called Arco Orinoco Mining in one of several desperate attempts to overcome the country’s crisis (3). The Arco Orinoco area comprises ​​more than 100 thousand km2, with deposits of gold, diamonds and coltan, among other minerals. There Maduro created a “Military Economic Zone”, placing the armed forces in charge of controlling and directing mining exploitation. Currently, there is a dispute over gold in the region, with various complaints regarding the military’s participation in both the registered companies and in illegal networks, involved in environmental destruction and violence. Local groups denounce that their rights are violated, deforestation and other environmental impacts are increasing, and gold mining is spreading beyond the designated area to other Amazonian territories (3). In Brazil, the new government of Jair Bolsonaro is also taking the first steps towards greater military presence in the control of natural resources and territories, especially in the Amazon. The new vision mixes disparate components mix with certain reactionary fantasies. Bolsonaro promotes liberalization in carrying arms and considers the occupation of rural lands as “terrorism”. Some days he claims that the indigenous people must become “soldiers”, but on other days he postulates converting them into “entrepreneurs” in the use of their territories. Most frequently, he marginalizes them as obstacles to progress. Schematic representation of the Andes biological corridor. The new president has also denounced what he calls international plots to appropriate the Amazon. 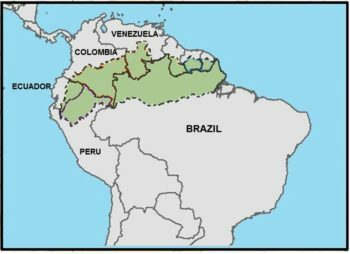 In particular, he questioned the initiative to create a “Triple A Corridor” that joins together protected areas and indigenous territories extending from one side of the continent to the other, from Peru (in the north of the Amazon) and Ecuador, along the northern zone of Brazil and adjacent regions of Colombia, Venezuela and the Guianas. (4) Bolsonaro also criticizes it for, according to him, operating analogously to forms of self-determination of indigenous peoples. In this he is not alone–there are military commanders who support him (5). Schematic representation of the Orinoco mining arch in Venezuela (blue) and the “Caja Norte” program in the northern Amazonian border of Brazil (red). This may explain the intentions of the Bolsonaro government to resuscitate the old military program of the “Caja Norte” of the Amazon, which includes the Brazilian territories north of the Amazon River along approximately 6,500 km of borders with Peru, Colombia, Venezuela, Suriname, Guyana and French Guiana. This initiative was launched in 1985 to ensure the defense of what they identified as strategic natural reserves, under the control of the Ministry of Defense. In Peru, police or military regularly launch interventions to put down citizen protest. The mechanism the government uses is to declare a state of emergency. The most recent occurred on February 15, 2019 in the gold mining areas in the buffer zone of a reserve in the southern Amazon. By some calculations, illegal gold mining there has caused the deforestation of 11,000 hectares of forest. These operations involved 1,272 police officers, 300 members of the armed forces, experts in explosives, and 70 delegates of the General Prosecutor’s Office acting by land, in the rivers and by air. They claim these forces will remain for about two years. (6 ) This reveals the enormous scale of these interventions. Police and sometimes military actions occur in several other countries. They have been reported, for example, in Argentina, especially in controlling the fracking fields in the south of the country; in Bolivia where they have protected the entry of oil companies into indigenous territories; in Chile with the deployment of the militarized police in the Mapuche areas of the country or in southern Chile to repress local groups that resist the so-called “theft” of water; or in Ecuador, where they have secured the protection of new mining ventures. In other cases, agents have been assigned to spy on local leaders, as in the case of Project X of the Argentine Gendarmerie, or more recently with the spying on church leaders in Brazil for their support of land claims asserted in the Amazon. It is possible to advance some conclusions about this military and police derivative on extractivism. The first is not to forget that the militarization of environmental management is not new, and for example in Brazil it is dragged from the military governments since the mid-twentieth century, although at that time it was focused on ensuring a territorial presence in an Amazon that many considered a green “desert” But at present it is becoming more and more evident in several countries. The second aspect is that this is promoted under both conservative and progressive governments. The similarities between Colombia and Venezuela are striking. Beyond the rhetoric and the participation of the State, the models of extractivism are repeated, with all their impacts. This indicates that we face a deeper problem that involves the roots in contemporary conceptions of development and Nature. A third issue is that the dispute is not really focused on how to protect nature, but on how to regulate mining, to control it and obtain part of the profits. For example, it is clear that in Colombia the State seeks to displace and replace illegal groups as arbiters and organizers of gold mining. In this way, a commodification of the environment is reinforced. The flip side is to conceal or exclude other understandings of nature such as those based on its ecological, aesthetic, religious, and historical values. Fourth, the policy legitimizes military and police as actors in environmental management. This is a substantive change in the tasks usually expected of them, and models like Colombia’s can lead to generals opining on the management of protected areas and indigenous territories. The community of ecologists, biologists and other scientists is once again relegated and the excuse of security serves to cancel out processes of citizen information and participation. A fifth aspect is the need to recognize and understand that militarization can have widespread local support, especially in areas where there is a high incidence of criminal violence. No doubt there will be many who will celebrate the arrival of soldiers and police. But the passage of time shows that the military presence often ends up fueling more violence. Colombia offers many examples of this. Local communities, especially peasants and indigenous people, are trapped between the military and police on the one hand, and illegal and criminal groups on the other. Sixth, the spread of this concept of security could lead to possible tensions between countries. This may be beginning to occur in the northern Amazonian regions. 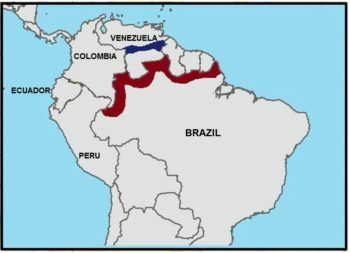 In fact, there the AAA Biological Corridor proposal affects the Orinoco Mining Arc in Venezuela and also overlaps the Caja Norte military plan of the Brazilian border. Finally, it is evident that this type of strategies will not be able to stop the social and environmental impacts of extractive industries. The generals control neither the market price nor the external demand, and it becomes impossible to place a soldier or a policeman at every Amazonian river or on every hillside. Meanwhile, huge financial resources are spent that could be used to sustain productive reconversions in the areas that need it most. However, despite all that, recent experience in Colombia and other neighboring countries, seems to point to stubbornness once again prevailing, to insist on environmental and territorial measures that have already been proven to be ineffective. Eduardo Gudynas is a researcher at the Latin American center for Social Equality in Uruguay (Centro Latino Americano de Ecología Social-CLAES). His most recent book is “Corruption and Extractivism”, with editions in Chile, Peru and Bolivia. (7) ER, IDL y CDDHH. 2019. Agreements between the National Police and extractive industries in Peru. EarthRights Internacional (ER), Instituto de Defensa Legal (IDL) y Coordinadora de Derechos Humanos (CDDHH), Lima.